The Shoreline-Lake Forest Park Arts Council is currently accepting submissions for the 2018 Shoreline Short Short Film Festival. This festival aims to support emerging and developing filmmakers in Washington State and encourage appreciation for the art of filmmaking in our community. Entries of “short short” films must be between 3 and 10 minutes and will be judged by an esteemed jury of filmmakers and film advocates. Returning judges include Tony Doupé, SAG/AFTRA Actor and Shoreline Community College Film Department Professor, and Denise Walz, Co-President of PRR Biz. Added judges include Vivian Hua, Executive Director of the Northwest Film Forum, and Award-winning producer and founder of Indie Movie Mastery, Jenna Edwards. Accepted films will be screened on Saturday, February 9 in the state-of-the-art Shoreline Community College Theater, and the best of the best will take home an artsy Sasquatch Award. Film submissions must be made via Film Freeway no later than December 21st, 2018. There is a small fee to submit entries this year. $15 standard fee for all categories except in the Student category. The Student Category fee is $5. 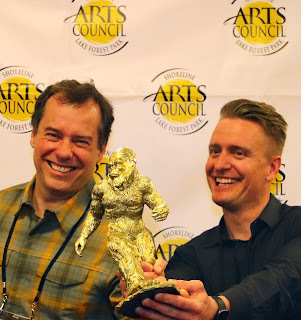 All winners will also receive an artsy Sasquatch Award that is sure to be the envy of any Pacific Northwest filmmaker! Additional information on our website! The Shoreline-Lake Forest Park Arts Council is proud to present this event with support from the City of Shoreline, City of Lake Forest Park, 4Culture, and individual donors, like you.